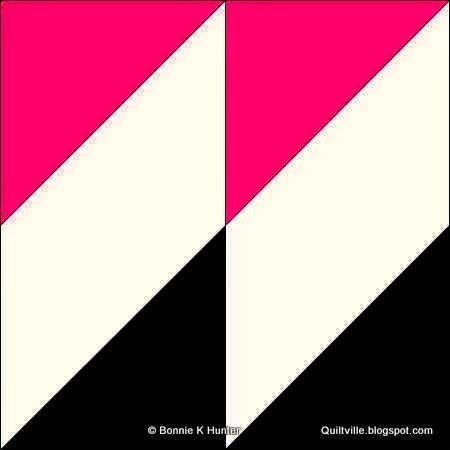 Last Friday Bonnie Hunter released the second clue in the Grand Illusion Mystery Quilt. Since it's Friday and the third clue is out, I thought I'd better get busy and work on clue #2. Here is what Bonnie's clue #2 looks like. You can see her instructions here. Remember I'm substituting the pink for orange. I told you about it in this post. 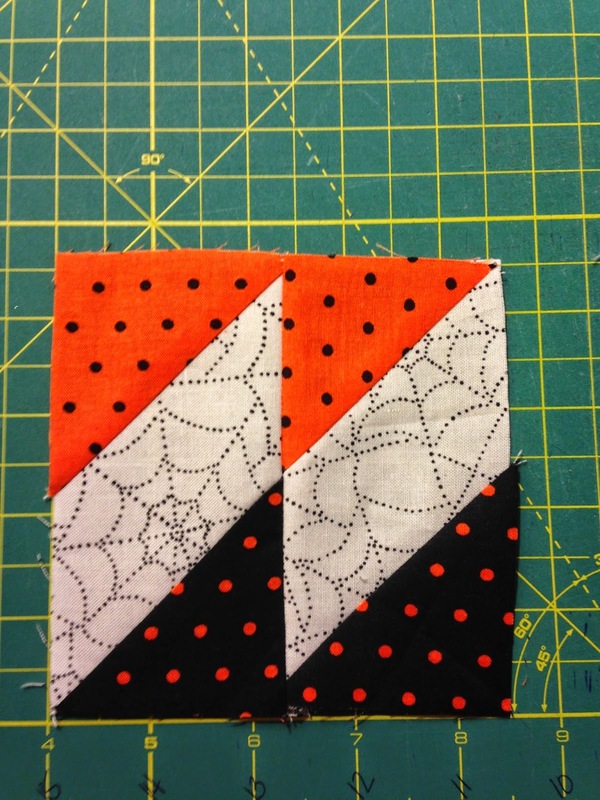 The first set of blocks I made I used the "stitch and flip" method. 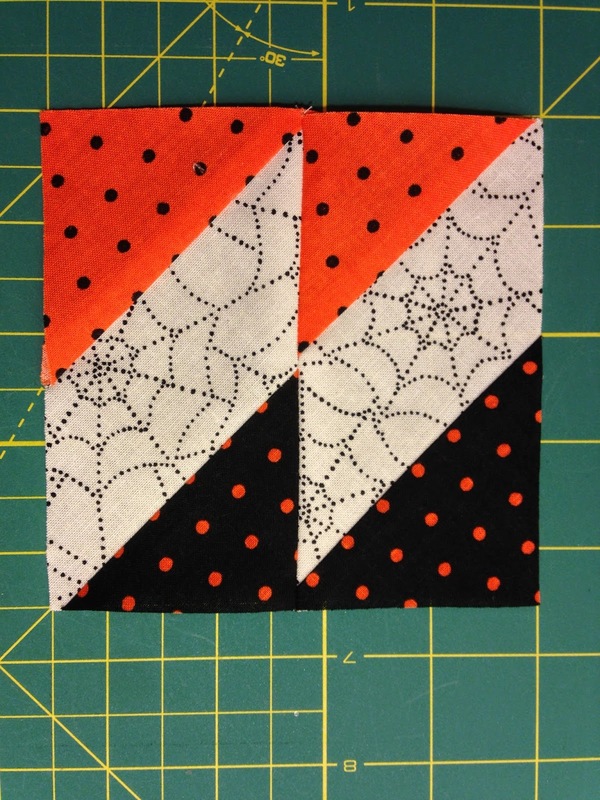 I cut a 4 1/2" x 2 1/2" background rectangle (the spider web fabric) and then cut a 2 1/2" black square and a 2 1/2" orange square. I used a little trick I read about on a FaceBook page, and I apologize to who ever thought of this because I couldn't remember who or where I read it. But it is ingenious! AND, it's even better because you'll be using a 3M Post-it-note. AND that makes the King very happy! Here's what you do. Instead of drawing all those diagonal lines on the square, just lay a post-it-note diagonally across the square instead. The idea is to use a post it note big enough to go from corner to corner. However, in the hotel room, this was the only size I had with me. But I think you can get it anyway. 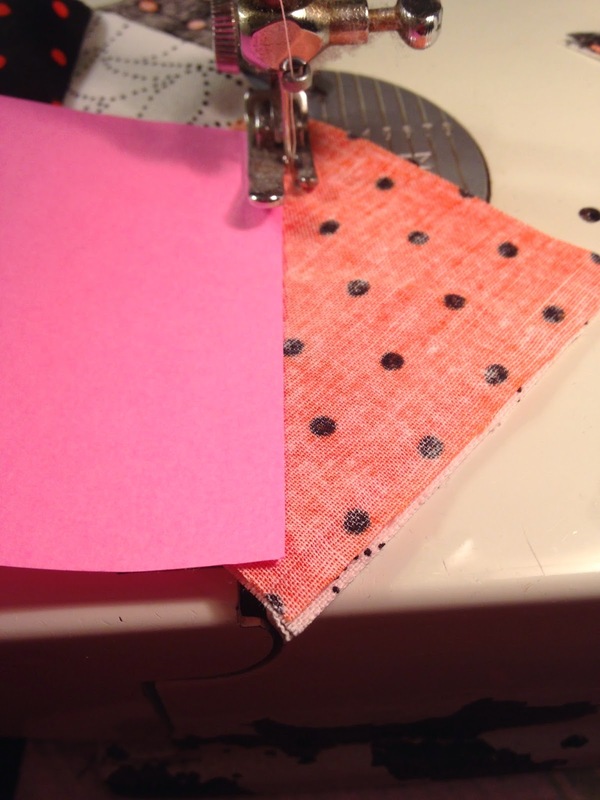 Then sew next to the post it note. It's perfect also because it gives you that little smidgen for flipping. Then trim off the excess. Don't throw it away though. 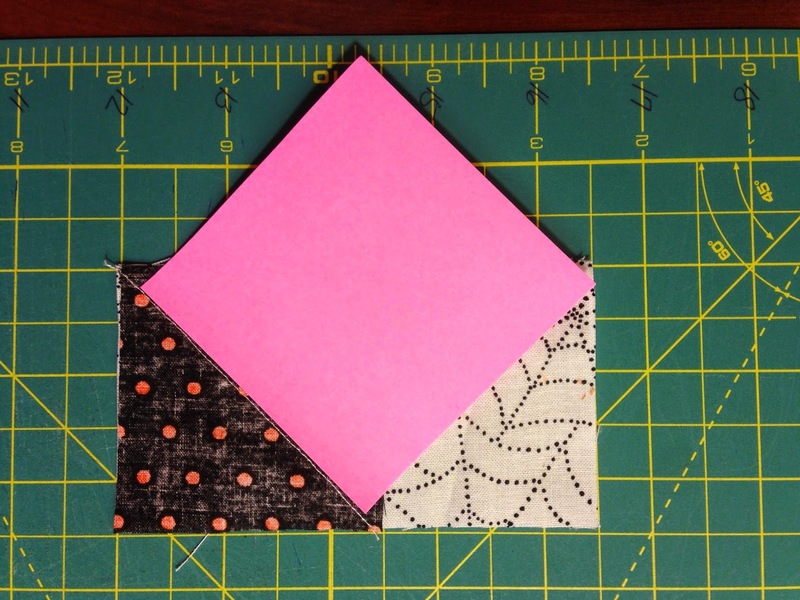 You can use the excess as a bonus half square triangle for another project. 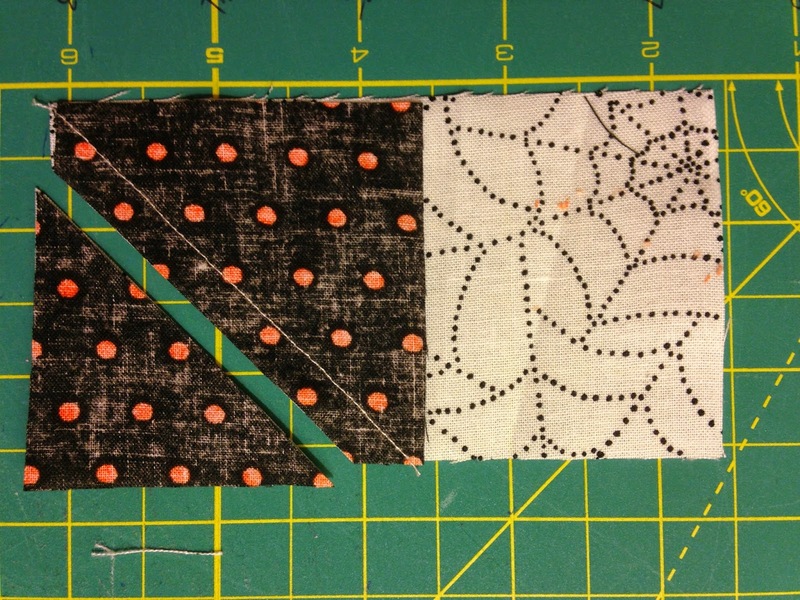 Although this method works great, I personally am not a huge fan of stitch and flip methods. It seems like I can never get them perfect, no matter how accurate I try to be. See the wonky corner on the lower right black one. It will work ok but it just bugs me I can't get it right. So I set out to use my own method. 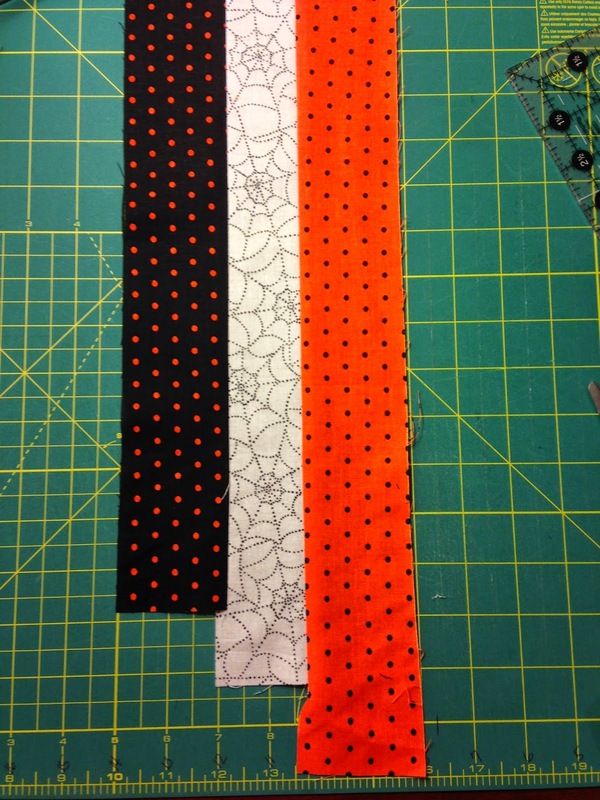 I cut a 2 1/2" orange strip and a 2 1/2" black strip, and a 2" white background strip. 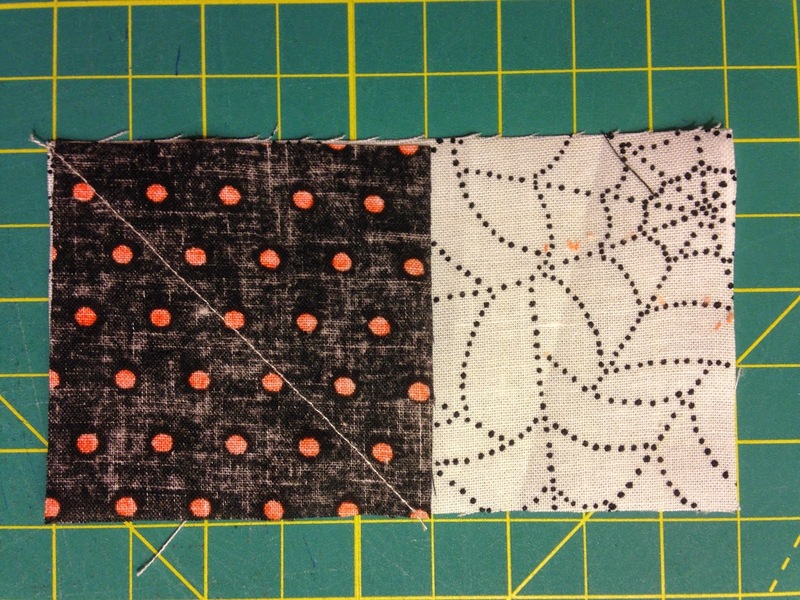 I sewed them together into a strip set. I also staggered them to reduce the wasted amount when cutting it on the 45 degree angle. I also had to flip it over on my cutting board so I got the correct angle of the cut. Pay close attention to this. 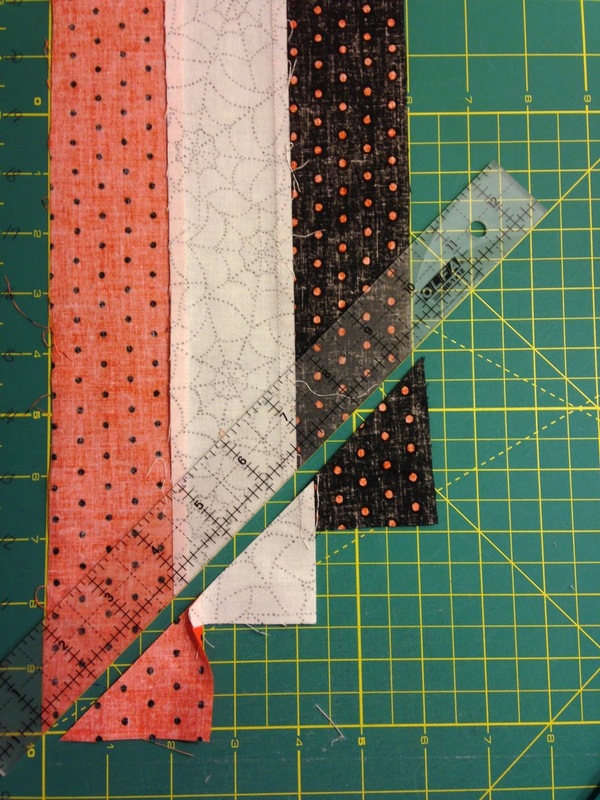 I lined by strip set up on the cutting board and lined my ruler on the 45 degree line on the mat and made the first cut. Then I measured over 2 1/2" and cut again. 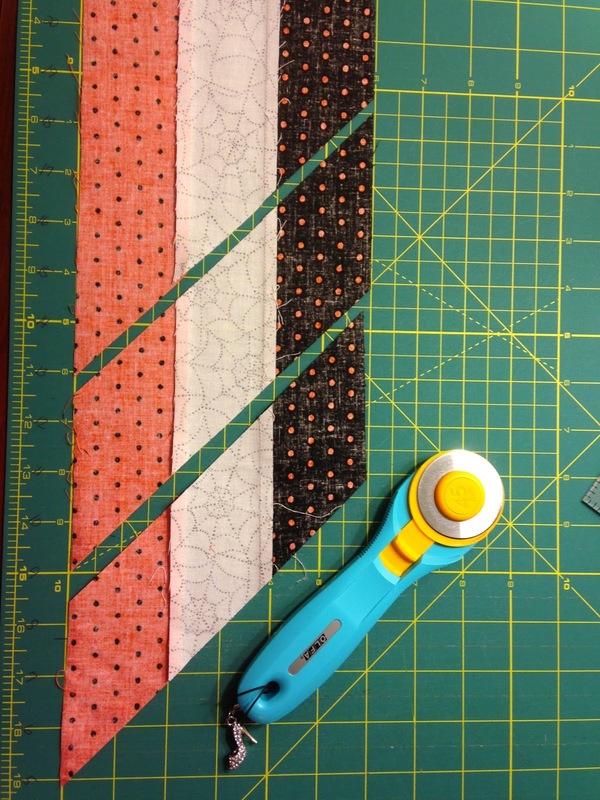 Continue to cut the strip set into 2 1/2" segments. 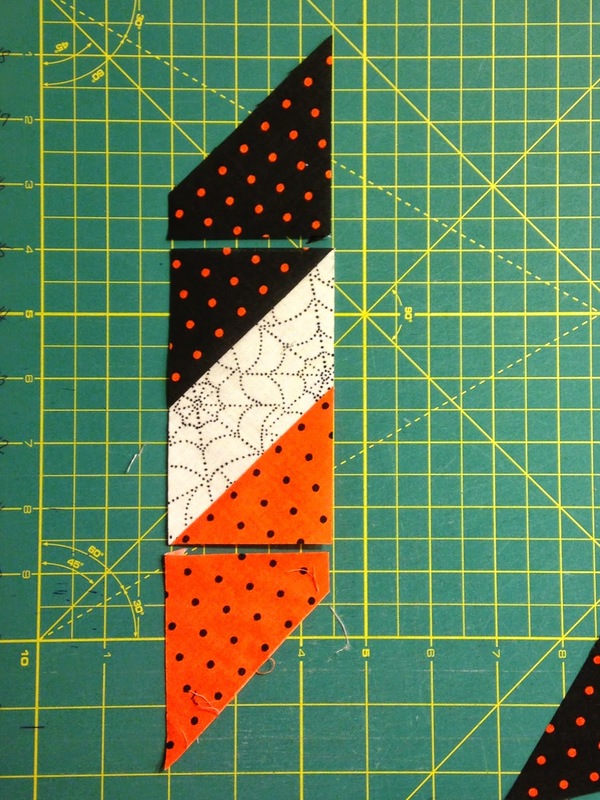 Now line the square up ruler on the segment and cut the triangle off the orange section. 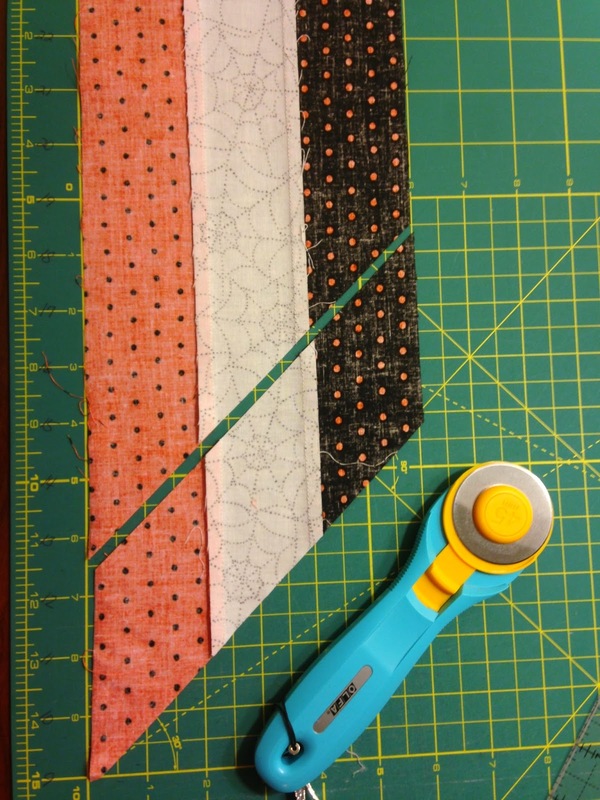 Now flip the segment and measure over 4 1/2" and cut off the triangle off the black. 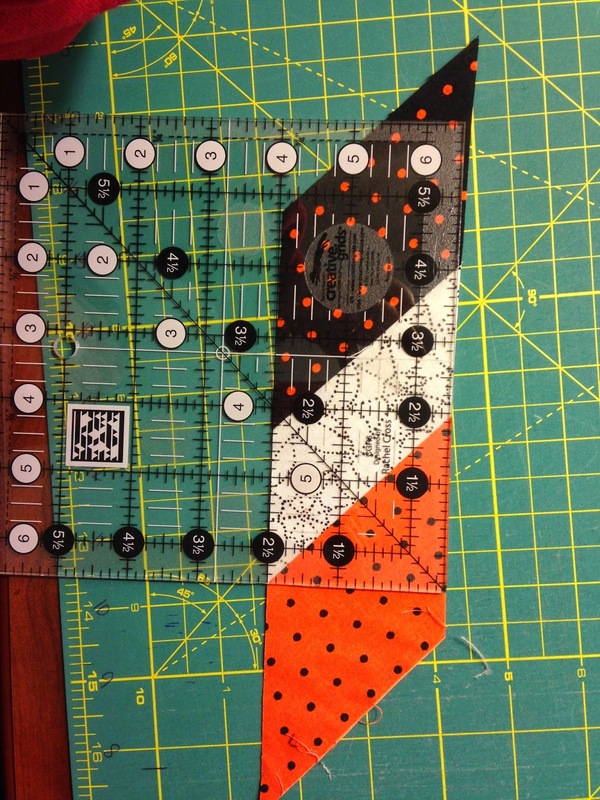 Are you making this Grand Illusion Mystery Quilt? Are you keeping up? What method are you using to make these blocks?